Throughout the history of Jesuit missionary work we find evidence of our modern term “inculturation”, otherwise known as “accommodation”. This concept not only helps missionaries meet indigenous peoples where they are with all their traditions, rituals, clothing, and historic influences, but it helps in the mission by making Christianity accessible to the locals. Matteo Ricci exemplified this in China; José de Anchieta, the first provincial of Brazil, learned the local language and used poetry and drama to catechize the indigenes; In India Roberto de Nobili shaved his head and adapted many local customs, which were approved by Pope Gregory XV—so long as they were not contrary to Christianity and did not imply superstition. Today this kind of inculturation or accommodation can still be found throughout the world. In 2010 I spent five weeks in Cochabamba, Bolivia studying Spanish at the Maryknoll Language Institute. Over half of Bolvia’s population identifies as indigenous which includes Quechua and Aymara people. How can Christianity find a place in a country with strong roots in the indigenous traditions that focus heavily on the Pachamama (Mother Earth/cosmos) and various gods? Inculturation finds a way. During my time in at the Maryknoll school an Aymara priest came to perform an Aymara ritual meant to harmonize the Pachamama, the cosmos. Interestingly, the man was also a Roman Catholic deacon. 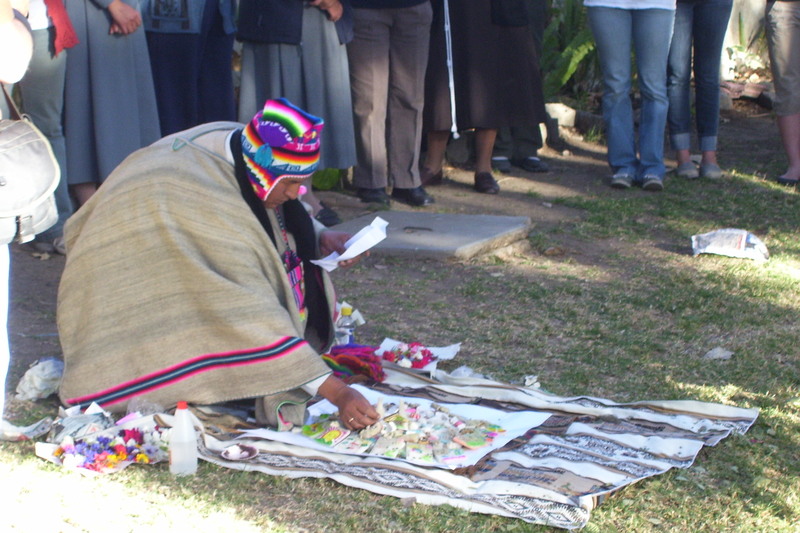 The ritual was filled with imagery: coca leaves, coloured llama fur, sugar sweets, silver and gold, and other elements representing the Pachamama as well as our petitions and prayers. He made clear that the ritual was not about worshipping another God but directed us to the one God through symbol and imagery. In fact, Christian prayer was incorporated into the rite. I couldn’t help but consider all the sacramentality in my own Catholic tradition: oil, ashes, palms, bread, wine, water, gestures, fire. Two students felt the ritual was idolatrous, but I wondered what was so wrong with incorporating Aymara symbols into Christian worship as channels of God’s grace. The ritual included beautiful symbols that do not exist in my Catholic tradition. For the indigenous, many want to practice Christianity but find it important to hold onto their Aymara roots. In the late 1960s the Church established an indigenous deaconate in Bolvia. Aymara deacons could now be a presence of the Catholic Church in Catholic indigenous communities. This made evangelization possible for the locals in their own language and culture, producing a kind of authentic Aymara Christianity. These people continued to keep various customs and practices of their indigenous religion, which were so engrained in the culture. Some locals told me that it is less about Aymara “religion” and more about the tradition. I reckon these efforts by the Church may be similar to those of Robert de Nobili in South India. So long as superstition was not attached the newly baptized natives could keep the traditional sandalwood paste on their foreheads and tuft of hair with cord. They could even keep their caste’s dress. These, de Nobili said, had no religious meaning to the locals and were simply cultural custom. De Nobili brought Christianity to these people, which perhaps could not have been done without inculturation. While de Nobili was a foreigner and the Aymara deaconate comprises natives, the spirit of the accommodation method is what is at work. As a Christian, I have the responsibility to share the Gospel message with anyone I encounter. I could not do so if I simply imposed my own customs that are a product of my Western-Anglo culture and personal upbringing. God reveals God’s self in many ways to the people around the globe. Cultural contexts and traditions must be used to find God. If Jesuits confess to finding God in all things surely they (and all Christians) can do so in non-Christian cultures. If we, like St Paul says, want to be all things to all people surely we can remove ourselves from the confines of our own culture in order to bring salvation to souls in another part of the world. Can we go too far? Yes. The danger is producing Christianity or Catholicism as a “product” that looks nothing like Catholicism. But what of a culture can we use for the greater glory of God? In Acts 17:22-24 St Paul tells the people of Athens that they are indeed religious and even have an altar that says “To an Unknown God”. “That which you worship, then, even though you do not know it, is what I now proclaim to you.” He states that the god they worship he is making known to them. He continues in verse 24 to say that God made everything in the world. It seems that Paul has a strong grasp of finding God in all things and through the religious practices that exist among the Athenians he points them toward God and Jesus Christ. As disciples of Christ, we must enter our apostolate not with the desire to make drastic changes to satisfy our own ways, but we must learn the way of the men and women we meet there. During my pilgrimage to Kingston, Jamaica as a Jesuit novice I encountered a culture very different than my own. Despite my desires for organized catechism and scheduling I quickly had to adapt to a culture where plans changed from moment to moment. Lesson plans for Sunday school often had to be altered last minute. I learned that Jamaicans learn through acting, singing, and passionate teaching and preaching. My experience of the Catholic Church growing up in New England just wouldn’t fit for the people of Kingston. Christians must adapt and inculturate themselves so to make accessible the Good News. Do we need to hold firm to our Catholic beliefs and tradition? Absolutely. But God did not create everyone exactly the same. We have been born into such different circumstances. We have been formed in many ways. There is no “one size fits all” Catholicism. Inculturation is the hope that brings the one faith to God’s diverse groups of children around the world.